Particle & Surface Sciences have introduced a new particle counter from Lighthouse Worldwide Solutions. The ActiveCount particle counter was developed for airborne biocontaminant detection in critical areas, such as clean rooms, food processing plants, pharmaceutical manufacturing and air conditioning (HVAC) systems. The ActiveCount particle counter detects, quantifies and prepares micro organisms present in the sampled air for lab qualification. The ActiveCount particle counter can identify contamination sources and determine the effectiveness of corrective actions. The ActiveCount particle counter is available with either stainless steel or anodised aluminium autoclavable sampling heads for use with 60 or 90mm agar plates. The ActiveCount particle counter 90C and 60 to 90/C incorporate flow compensation to maintain accurate flow rates. 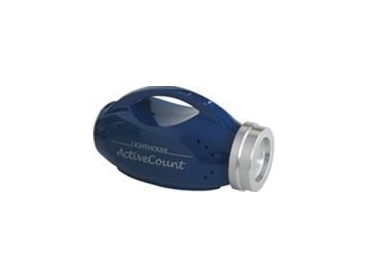 The ActiveCount particle counter incorporates a rechargeable Nickel Metal Hydride (NiMh) battery for portability and its compact size and light weight allow for sampling in areas with tight clearances. The intuitive control panel and infrared remote control visible to the instrument from any angle make the ActiveCount particle counter easy to use.